If you plan to do any shopping while visiting Oahu, the famous Ala Moana Center in urban Honolulu should be at the top of your list. With over 350 shops and restaurants and over two million square feet of retail space, Ala Moana is the largest open-air shopping center in the world. The Ala Moana shopping experience also includes live Hawaiian music, hula performances, a play area for children, and much more. There’s something there for everyone! 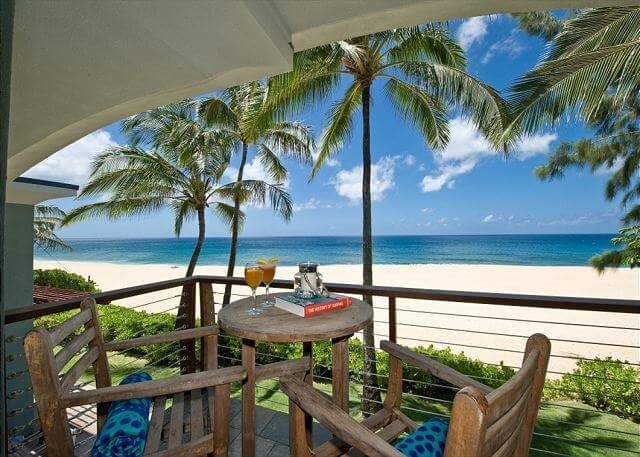 Planning your Oahu vacation will allow you to make the most of your stay. We recommend setting aside at least one day for your Ala Moana shopping excursion. When you’re ready for other adventures, be sure to access our complimentary Oahu Travel Guide! It’s a thorough resource that outlines all of the best attractions on the different shores of Oahu. Don’t book your Oahu vacation without using this vital resource! The name Ala Moana means “path to the sea,” which is fitting due to the shopping center’s proximity to the sea. The center’s connection to the ocean is reflected throughout the complex in art displays, koi ponds, and fountains. This shopping mall features a wide range of clothing stores, including department stores like Neiman Marcus and Bloomingdale’s, and designer stores like Chanel, Prada, and Versace. Ala Moana also has several shops dedicated to shoes, health and beauty, jewelry, and more. Need a little inspiration before you shop? Browse the Ala Moana Shopping Magazine. Need a little direction once you’re there? Consult the Ala Moana Shopping Center map and directory. The Ala Moana mall hours are Monday through Saturday from 9:30 a.m. to 9 p.m., and Sunday 10 a.m. to 7 p.m. There are a staggering number of Ala Moana mall restaurants – nearly 100! Many are in or near Makai Market which serves as Ala Moana’s food court. There are also a number of full-service restaurants, many of which have full bars, such as Islands Fine Burgers and Drinks and Lucky Strike Social. 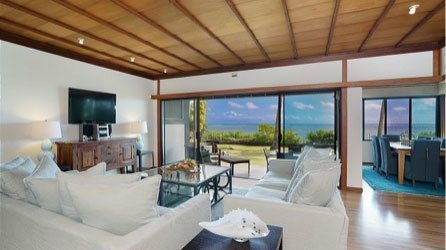 Hawaii Beach Homes has several luxurious rental properties close to the Ala Moana Shopping Center! Our South Shore properties will put you close to some of Oahu’s best attractions like the Honolulu zoo, historic sites, museums, and restaurants. The South Shore also offers plenty of fantastic outdoor activities like hiking an extinct volcano or exploring a tropical rainforest. Treat yourself to our incredible Ocean Estate for an unforgettable vacation! 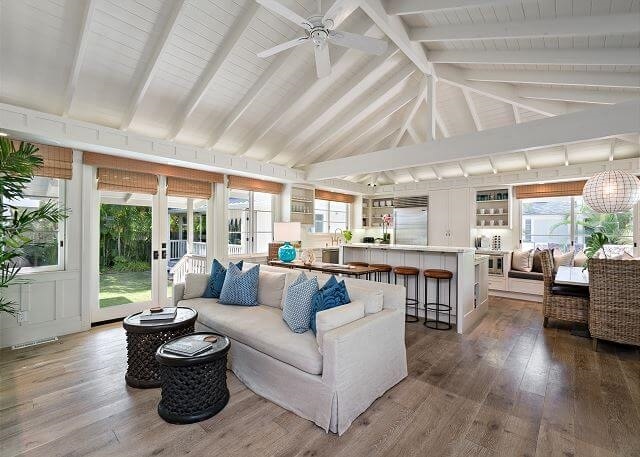 This home sits on one acre of private beachfront property and features premium amenities like a seaside hot tub. Enjoy views of the ocean right from your comfy king-sized bed. Then, be sure to spend some time lounging in the open-air sunroom. You’ll want to return to this magnificent home again and again! 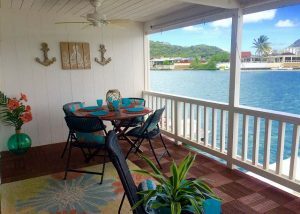 If you’re ready for an unforgettable Oahu vacation, be sure to book a stay with us today! We look forward to hosting you very soon.